The Titans are lost in the time stream, thanks to Johnny Quick of the Crime Syndicate. They are being bounced back and forth through a number of wheres and whens, staying for only a short time before being bounced back into the time stream. Through these snippets of action, we learn something about Bart’s past that is a true shocker! Meanwhile, Tim Drake is looking for a way to pull the team back together before they are literally torn apart by the time stream. What can he do about their situation, and what price must the team pay to get out of this fix? For that, you’ll have to grab the issue. 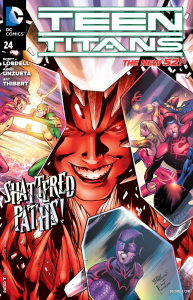 Scott Lobdell has set up a great script for this issue. It would have been far too easy to let these different times and places cause the story to be fractured…not so here with the use of Red Robin’s character to pull these storylines together. The art teamof Angel Unzueta on pencils, Art Thibert on inks and Pete Pantazis on colors handled the various times and scenes well throughout the issue. This issue sets up some major plot lines, especially for Bart – I’m looking forward to whatever comes next! 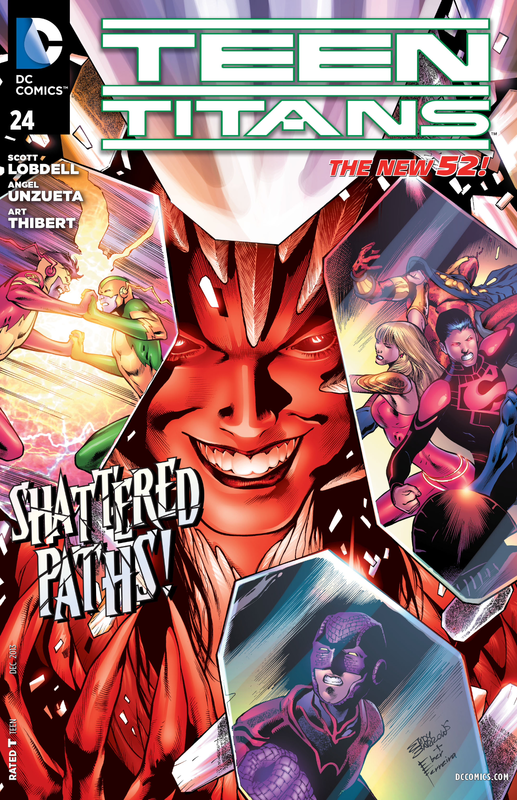 Biggest spoiler is on the cover, really — we get a New52 version of Inertia (with a bit of a twist). never even noticed the Inertia wannabe… just too disappointed in the Flash/Kid Flash of the new52… 🙁 saddens me to see all the heroes go “dark”. I’ve packed in with this book but I’m curious as to what the Bart revalation is – it couldn’t possibly be that he’s really been a very naughty boy. Not in the New 52! Am really kind of hoping Max Mercury doesn’t make an appearance again–at least until after the current admin is gone. For me, either a character’s personality has been downgraded…or their costume has. Alas, tis not only DC, but Marvel too. Now Pym is being screwed over by the movies while Peter Parker has died as ignominious a death (and then eventually MIA) as was dealt to Wally. I’m running out of past-favorite comic-book characters to root for. 🙁 Really, really hoping the Doctor Who anniversary doesn’t stink as well. Give me *one* *good* memory for this year, dy Entertainment Industry!